I thought the size of a lasagna pan would be a much more "useful" size considering the size of my sketch book. 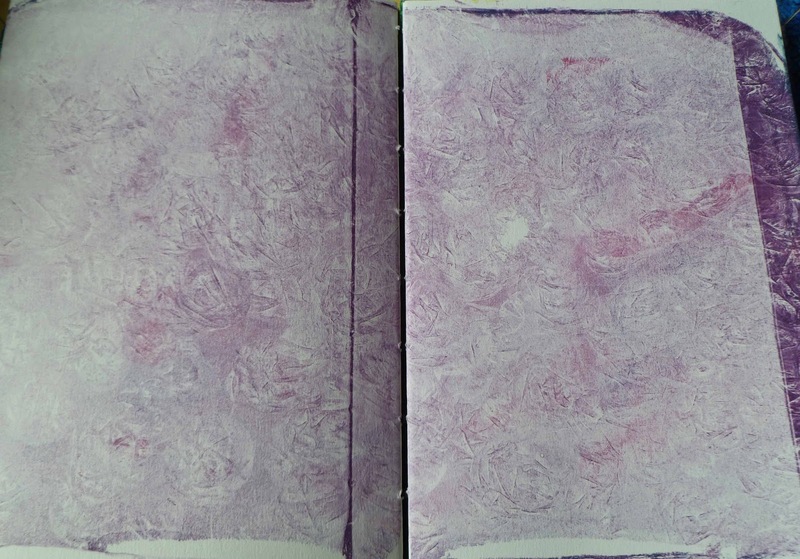 I used a paring knife to slice the gelli plate into smallish (1" X 1") squares then put them in a glass bowl and microwaved for one minute X 3, stirring after each minute. It was a snap. Today the manufactured Gelli Plate came from Blicks but I like the size of my "newly melted" plate - 9X13, It is will be hard to whip up enthusiasm for the actual $30. 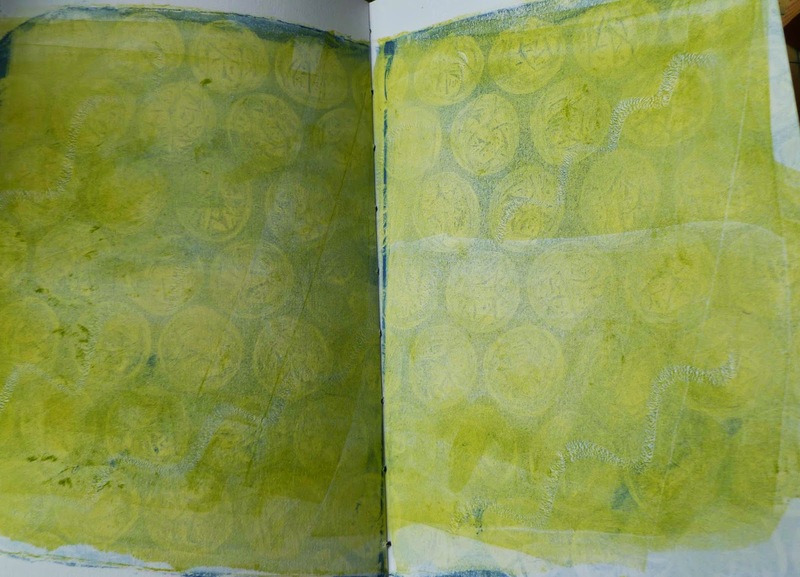 Gelli Plate. Re-used bubble wrap without washing the blue off. 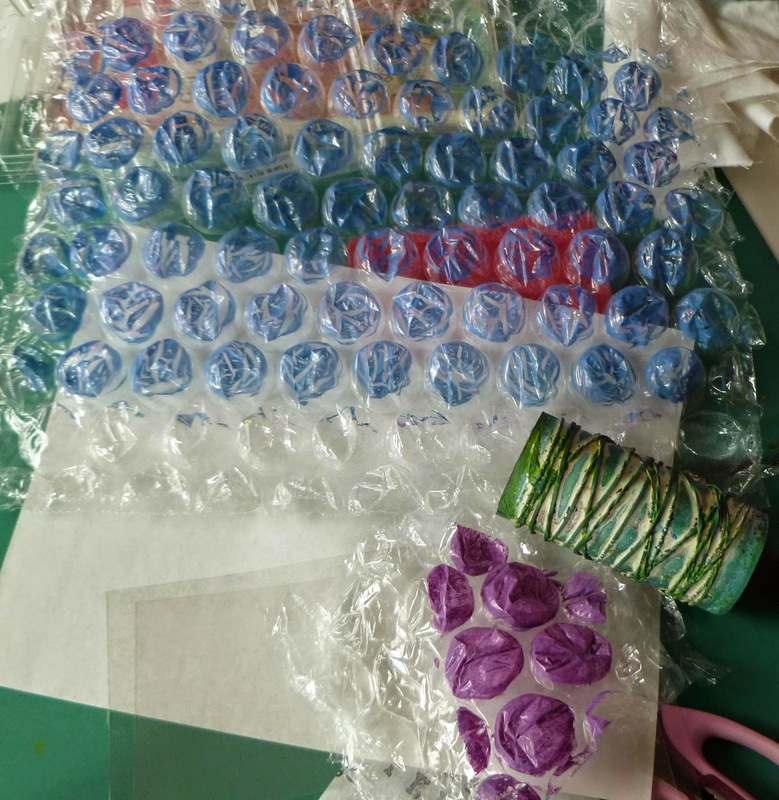 Use a bubble wrap "dauber" and got light colored and interesting marks. Another winner. Too much. 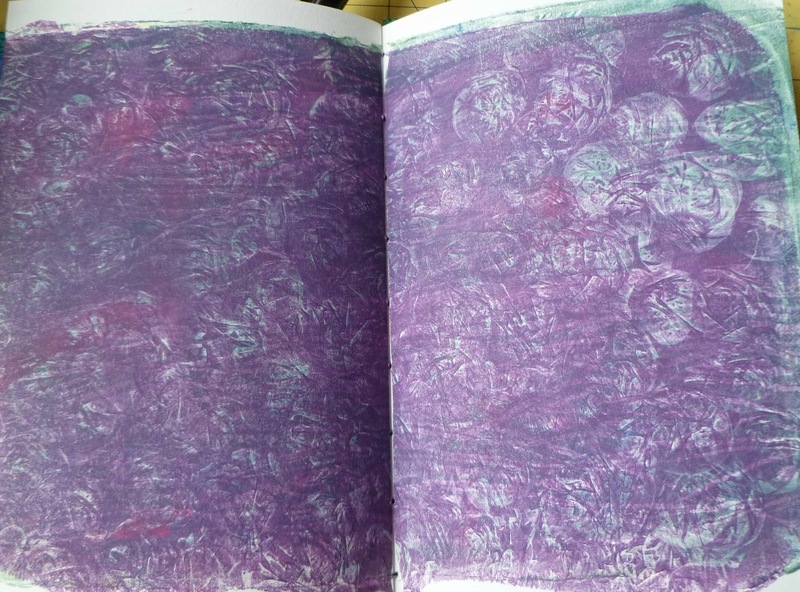 The green under the purple was a wonderful page ruined by too much purple. Yellow with bubble wrap over solid (light) green. Stamps on chartreuse. Note to self. 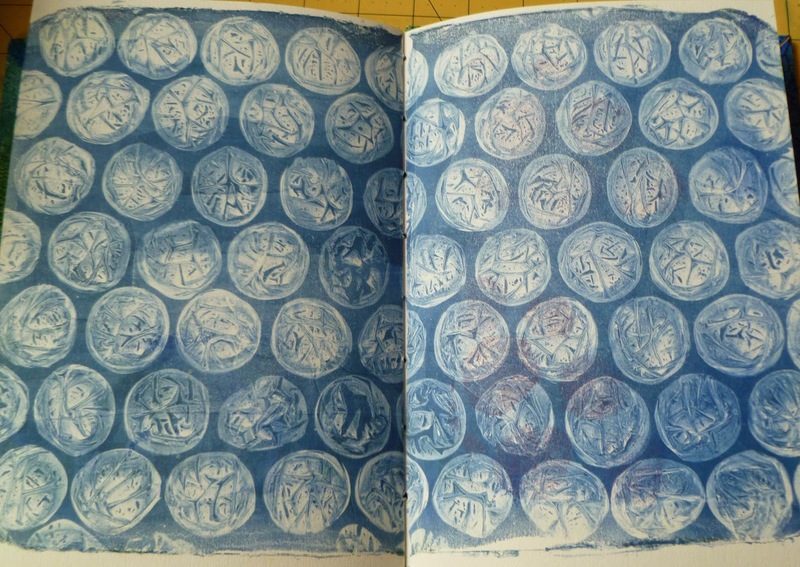 Hand cut rubber stamps show too many cut marks on the background. 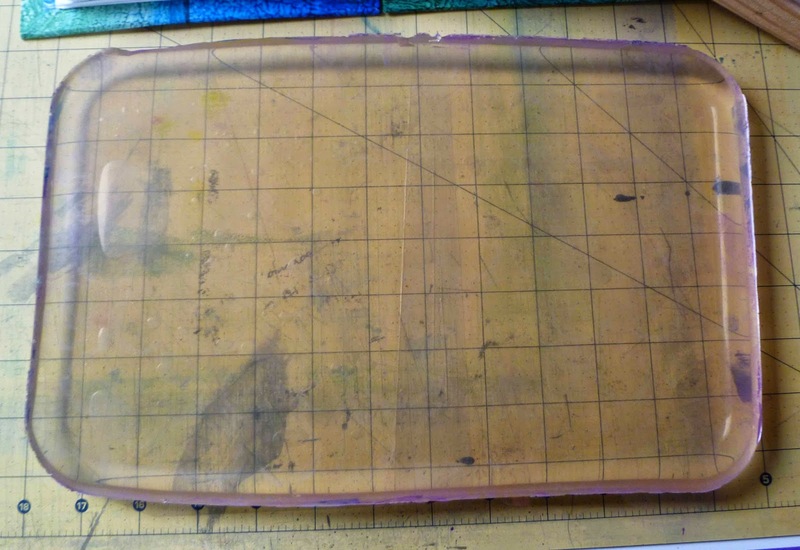 Use thick stamps with no background (like foam core cut). Used new plate. I later cleaned it with a terry wash cloth with water. You can see the two overlapped sheets of transparency film in the center of the photo above. I also covered the plate with transparency film after returning it to the pan for storage. 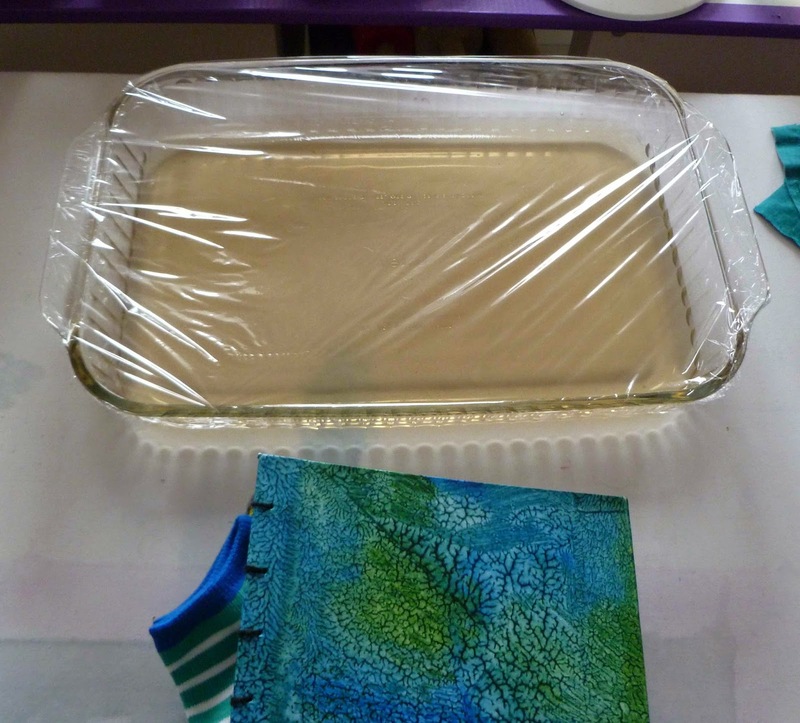 Can you see the "transparency film" I put under the gelli plate? Sheet of "big" bubble wrap (blue) and the smaller piece of purple I used as a dauber. 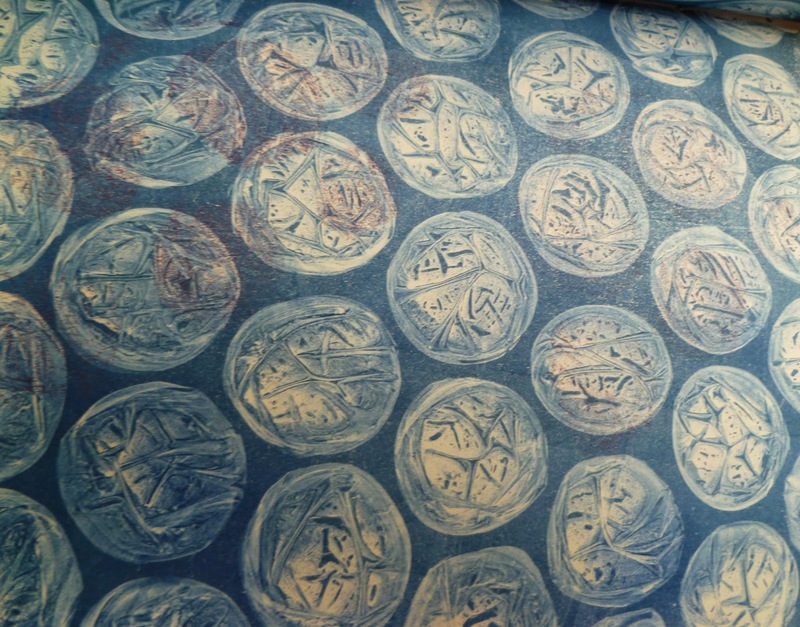 The sticky lint roller (from the dollar store) with elastics wrapped around it is one of my favorite tools for stamping or marking on the gelli plate.. If it gets too gooked up, I can remove the elastics, tear off one layer of sticky paper and apply new elastics. Great prints! 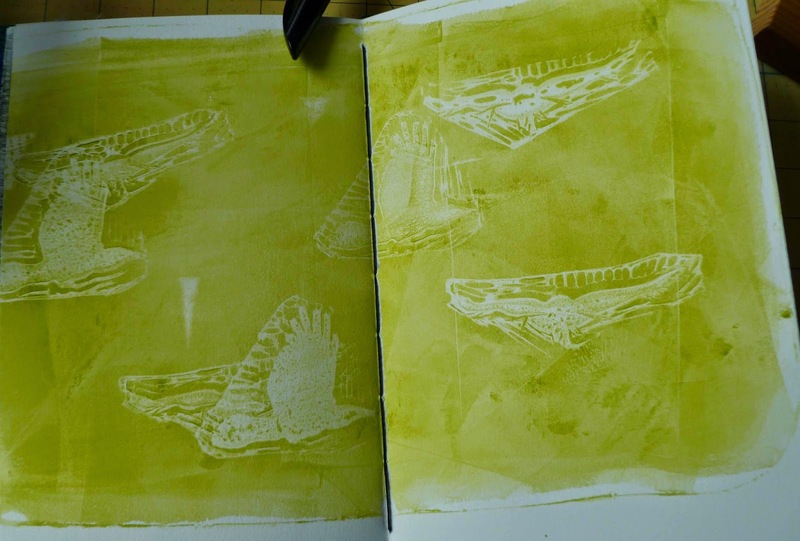 And I really like the idea of the make your own permanent printing plate. 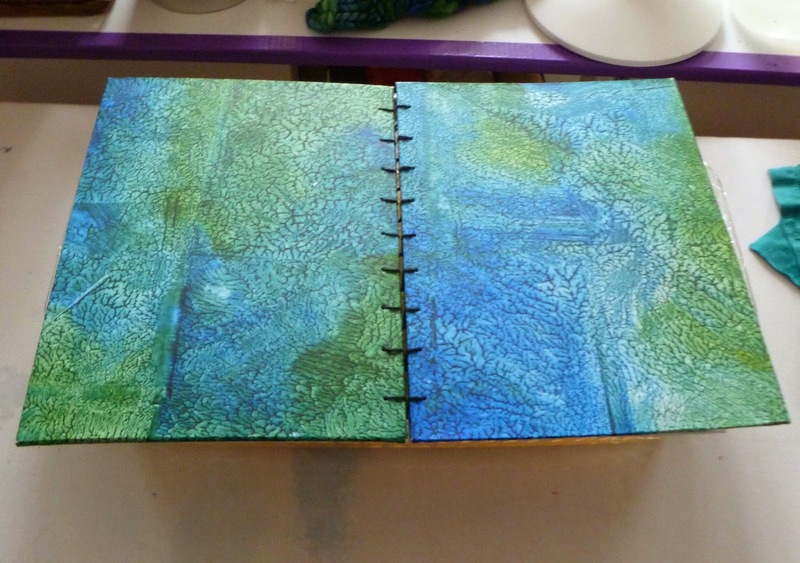 I have one of the gelli ones. I like it but if you are printing fabric that you want to use in a larger piece since it is mono printing you only get such a small size. And I like the lint roller idea. Never would have thought of that one. Wow, Beth! 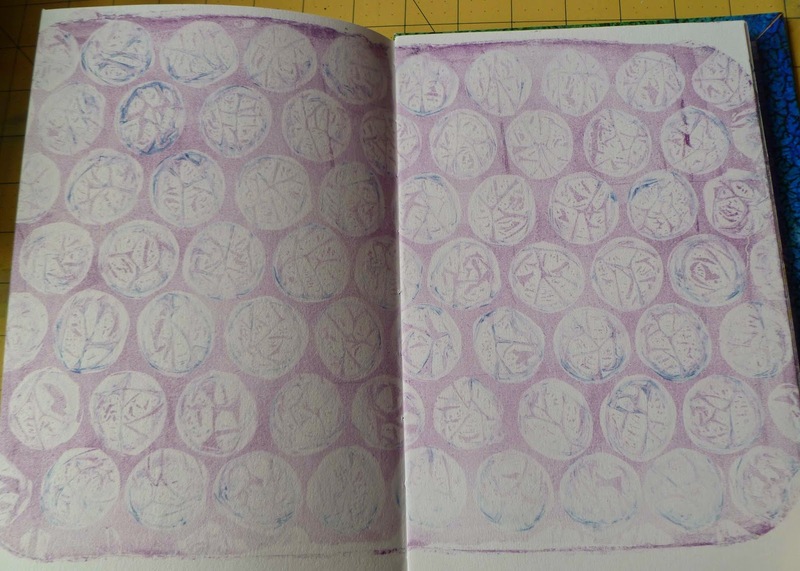 I love what you are doing here, and plan to use my gelli plate for my July Surface Design Round Robin posts... been making some stamps to play with and you just gave me some more inspiration with your bubble wrap and rubber band roller stamp - thanks! 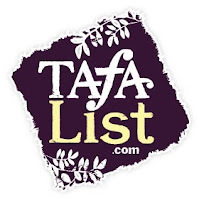 Great prints and great tools for printing. Giant bubble wrap is my favorite, and I will have to try the lint roller/elastics trick too. I love your experiments. thank you for sharing everything. 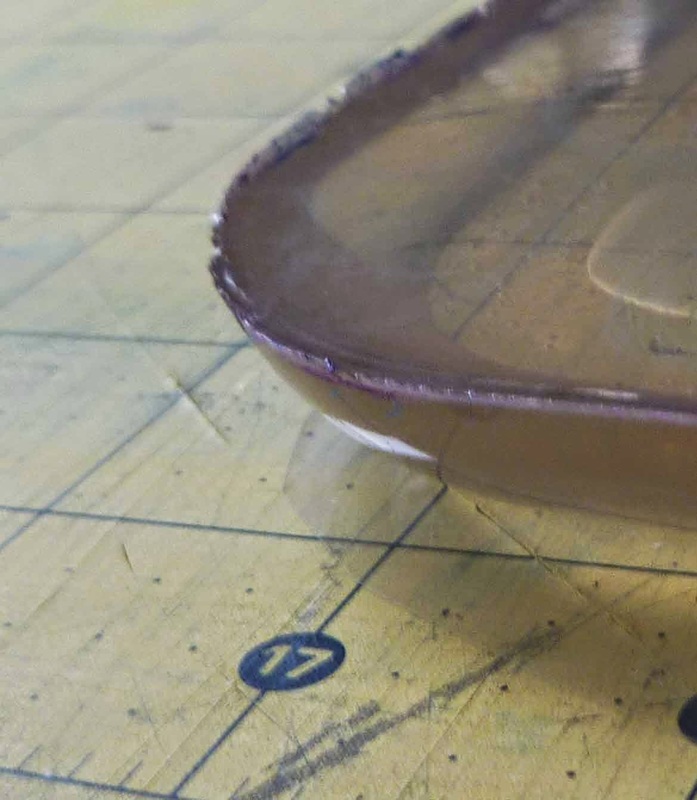 I've been watching the progression of these home made permanent gelatin plates with a great deal of interest...how are you storing them...at room temp. or in the fridge? I store it in the 9 X 13 pan I poured it in. I have it laying flat in the pan on a shelf out of direct sunlight. So far so good. The most interesting thing is printing on fabric! !